Hello all, here I am again with my second ‘stunner report’. Before I start giving notes and quotes for the new-found stunners, I would first like to put the spots on a recent and imminent development in the whisky industry: Recent enormous price increases also shock the Malt Maniacs. It is getting crazy: the new Black Bowmore comes out at 2000,- GBP, earlier, there was the Ardbeg 1965 for approx. 3000,- Euro, Ardbeg even made it crazier with the Ardbeg Purdey Gun Case: two bottles of Ardbeg 1974, with off course a beautiful wooden box together with a gun, for the price of 12.816,- Euros (a fellow Maniac proposed to point that gun to the marketing idiot who came up with that idea). Off course, the indies noticed this, so they also try to pick a grain. We saw a Springbank 40yo 1967/2007 at 43,1% from Duncan Taylor at the Weinquelle (Hamburg, Germany) retailing at 1.399,- Euro, but the thing comes … in a nice wooden box. I think I should help those purchase departments for buying wooden boxes, because they seem to be doing a worthless job !!! After Whisky Live Paris (which I didn’t attend), lots of rumours came about crazy prices of more ‘standard’ Laphroaigs, Lagavulins, etc. … they are all suffering the same disease: they are getting money-sick. 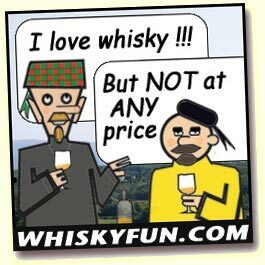 For this reason, we think the whisky-lovers-lunatics should give a clear signal. We should say NO to that kind of bottlings, and leave those to collectors. I mean the type of whisky collectors who just look at their bottles and don’t drink them. I even would dare to expand this ‘no’ also to the all types of ‘drinking’ bottlings that are reaching unreasonable prices. I have been able to select a dozen more of whiskies that have a good price/quality ratio (of course according to my personal taste). Good news is that Duncan Taylor (yeps, the guys from the 1967 Springbank) not only produces collectors’ bottles, but also is an outstanding supplier of stunners. Also the guys from The Single Malts of Scotland are regulars in my report. This time, I tried to search some ‘obscure’ stunners as I promised. I succeeded in finding 5 products from more so-called ‘obscure’ distilleries. Nose: a blast of peat, very phenolic, medicine, hints of straw. Palate: smooth and oily, a blast of peat, remains very phenolic and medicinal. A peat-bomb in any sense of the word. A nice finish with an interesting development. Nose: a basket of green fruit, nice oakiness, some hints of vanilla, a nice malty sweetness. Palate: slightly peppery and quiet oily, malty sweet, orange, green apples, minimal whiffs of peat, leathery. Fruity and oaky notes keep on dominating in the finish with also some interesting nuttiness, which I often have while tasting Clynelishes. Nose: mineral notes, malty sweet, sligtly peppery, very clean and grassy. Palate: oily and rather smooth, evoluating to slightly peppery, mineral notes are quiet dominant, remains very clean. Nose: a delicate peatiness, quiet some citrus, some chalky notes. Palate: pretty oily and peppery, very nice mouth feel, a fruity peatiness, orange zest, mineral. A nice and complex finish, lasts quiet long. Palate: spicy and initially dry to get more oily, clean, salty, a very nice and complex development. Very nice and warming finish. Nose: slightly alcoholic, straw, dried flowers, pears, peachy notes. Palate: peppery and slightly oily, VERY nice development, liquorice. Warming and pleasant finish, keeps being peppery, a nice one. Nose: seafood, malty sweet, very clean, pine apple, vanilla. Palate: slightly spicy and initially rather dry to get creamier, malty sweet, straw, kiwi fruit, hints of vanilla. Nice marshmellowy finish, pleasant but not to long. Nose: deep nose, wet forest ground, humus, sweet pears, subtle floral notes. Palate: spicy and a pleasant creaminess, fresh fruity tones dominate, white chocolate, bananas. A nice, complex and pretty long finish, with in the end hints of a pine forest. Nose: very clean and grassy, green apples, a sharp maltiness, dry lavender, mineral notes. Palate: pretty dry, malty sweet, very fruity, nice spiciness. The finish is nice, but straight ahead, remains pleasantly spicy. Verdict: 86 points : I got this one twice blind before me: during last year’s Malt Maniac awards, and now again by Bert Coorevits. Nose: peppery, mineral, very clean, wet grass. Palate: spicy and initially creamy, mineral, coconut, slight bourbonny notes, vanilla. The finish gets more floral, combined with a nice malty sweetness. Nose: very coastal, nice peaty veils, very medicinal, a true citrus basket, some almond. Palate: a firm and creamy mouth feel, coastal notes remain, much citrus, mineral, I keep on getting hints of peatsmoke. This smokiness also persists in the finish, nice complex finish. Verdict: 89 points , evolutes really nice – Ca. € 52 … I know, more than 50 again, but for the same reason as the Tullibardine. Nose: coal, mineral, peaches, marshmallow, floral, sweet apple, burnt sugar. Palate: smooth and creamy, peaches, sweet fruitiness combined with nice floral notes. Remains fruity sweet in the finish, but drying up in the end.